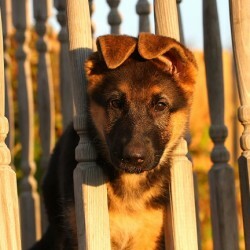 Your German Shepherd puppy is going to a be burst of loving energy that makes you smile every day. But, there is a lot of that energy. You will want to train them early on, so you can ensure that their energy is directed to good things like play, and not bad things like eating a pair of your Under Armour shoes. 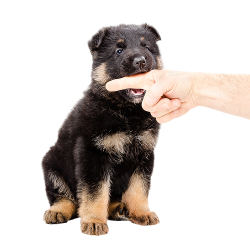 Let’s take a look at what you need to know to get your puppy trained as quickly as possible. First and foremost, you need to know that you’re the one in charge of how successful this training will be; not the puppy. Your level of patience, compassion and empathy will be everything. Building good habits means exposing the bad ones first. While they’re exposed, it’s your job to stay patient, stay kind, and stay in control. Reacting to any “bad” behavior with anger or with violence/ physical discipline is only going to sour your relationship with your new best friend. So that is never the answer. Your voice and your demeanor can show your puppy that you’re in charge, without having to resort to physical punishment. 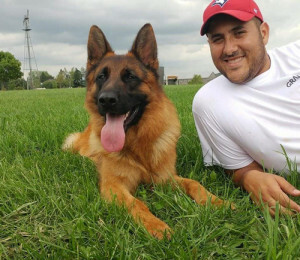 It’s never too early to start building good habits, for you and your German Shepherd dog. The training process really begins the day you bring them home. 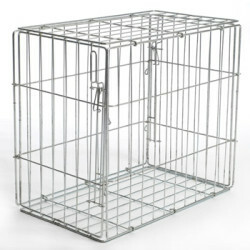 You need to help them get acquainted with their new surroundings, while you divert their attention from mischief. The early days of training are all about lovingly setting boundaries. This is how good habits are built. Again, you want to focus on rewarding the good behaviour, not punishing bad behaviour. Let’s take going for a walk for example. Your puppy is going to want to stray and investigate anything and everything in this new world they’re in. The absolute wrong thing to do is yank on the leash to “correct” their path. There’s nothing correct about that. Instead, encourage your puppy back onto the sidewalk, wait until they return to your side, then show you’re pleased and reward them when they come back. You need to show them that this is how we’re going to walk from now on, and reward them for understanding. Yes, that means your early walks are going to take longer. But the payoff will absolutely be there before you know it. Of course, if you really want to get off on the right foot (or paw), trust the experts. 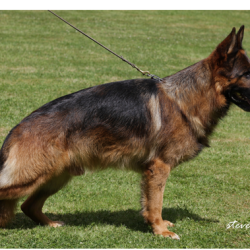 Working with a professional dog trainer who understands the German Shepherd breed is the best way to get off to a great start. Ready to start? Our obedience training usually begins with a one-on-one session, to see exactly what you and your dog need.